Christians have a reputation for being against things. This is fair enough – the world is presently full of evil – but not far enough. As Paul told the Ephesians, ceasing from doing something wrong is only the beginning of the Christian journey. The thief not only stops robbing, he starts earning fairly – and this is so that he can give what he earns away, a complete transformation. Similarly, corrupting talk is not replaced with silence but with encouraging words. 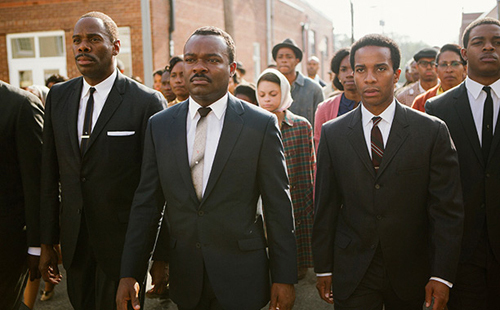 It’s already being marginalised in the cinemas but Selma is a good film telling a great story. Christians are likely to be astonished by how generously God is portrayed in it. Those who flocked to see “biblical” films such as Noah and Exodus: Gods and Kings should pack out the theatres where Selma is being shown for it portrays the God of the Bible more accurately than either of those films. There has been much comment on the Academy’s decision not to nominate David Oyelowo for its Best Actor Oscar, but I suspect his subject would prefer to be in the Best Supporting Actor category. Although Martin Luther King’s character has greater depth than anyone else in the film, it is God who is repeatedly credited with leading the civil rights movement. I’m not sure if I’ve ever seen a film depict Christian faith so normally. There is no cynicism or mockery, and the faith of racists is not used as a counterpoint to undermine the significance of Christianity to the story, as it might easily have been. It is God’s Word which comforts King as he languishes in jail, it is God’s leading after prayer that causes him to make an unpopular decision which is ultimately vindicated, it is Christian ministers who fight fairly for justice (weak and sinful though they are), and it is God who is explicitly given the glory as the story concludes. Faith is one of several volcanic undercurrents in Wolf Hall, the BBC’s adaptation of Hilary Mantel’s novels about Henry VIII’s advisor Thomas Cromwell. I’ve been watching each episode twice: first for the story, second to appreciate the themes and details, both times for enjoyment. I haven’t loved a TV show this much since The West Wing. Life for Cromwell and almost everyone else here is lived on the edge of an axe blade, fraught and ever at risk from the hurricane of a king’s will. For a story so familiar and far away, Wolf Hall feels remarkably real. Scenes are set like Renaissance paintings (literally when we see Holbein making Cromwell’s portrait), and lit only by sunlight and candles, as they would have been. Mantel told the director to remember that no-one in it knows that they’re in history: they are people wearing clothes, not characters wearing costumes. Close-ups abound – we are with them. As in the novels, explanations are not always given and the action can feel disorienting. It takes its time. In other words, it’s like real life. 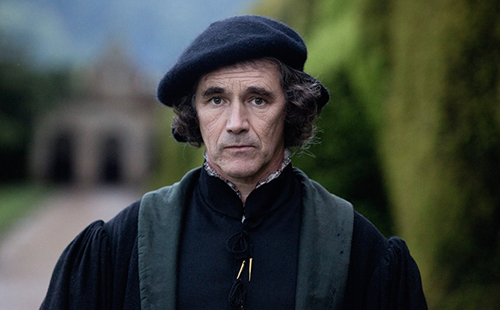 All of this is excellent, but is eclipsed by Mark Rylance as Cromwell. He and Mantel have made their man a Machiavelli we might cheer for, jousting without a lance, on the rise but always at risk of being destroyed in a society that isn't yet our meritocracy but is slowly, grudgingly, moving that way. The best at living on that axe’s edge, he is a lawyer, a fighter, a Renaissance man, a believer, a pragmatist, an avenger, a servant, a master, an awkward father, a scarred son, a lover, a widow, a hunter, the prey, an ally, an enemy - often several of these at once. Rylance can show you which by the angle of an eyebrow, or an intake of breath. It’s an astonishing performance. No doubt there are many other good things around to be received and appreciated but these are two that I am particularly grateful for.